For quite some time I have been having a row of sensitive teeth, or gum specifically, on the upper left side of my teeth. I think it started way back when I was using one of those electric brushes with oscillating head. The brushing process was a bit harsh and it bruised my gum and pushed it upwards, and since then it has never been quite the same again. The sensitivity was a bit superficial in a way that the pain was not too deep, localised just around the gum, which is why I think I don't necessarily have sensitive teeth. Anyway, a serious teeth sensitivity should always be checked out by a dentist since there can be a serious problem hidden underneath. Mine wasn’t too severe until it became bloody. I mean I began to spit a small amount of blood while brushing. My first thought was I should change the brush - I know it should be the dentist. 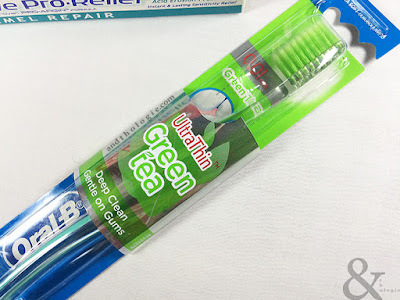 But anyway the brush I was using was a bit tough, so I changed to a toothbrush which has a softer and finer bristle, which is the brush I’m still using now, the Oral-B UltraThin Green Tea Toothbrush. You cannot argue with those bristles... I tried. 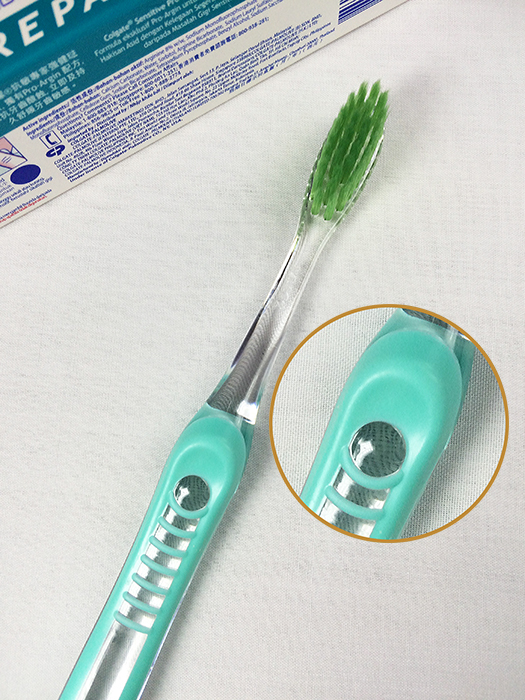 The toothbrush has visibly finer bristles and green in colour and the handle is a mix of a green rubber-like strip and transparent plastic. I especially like the transparent design but, because of that, the handle is slippery when wet mixed with a bit of toothpaste. The usual placement of my hand while brushing my teeth had always been towards the end of the handle. 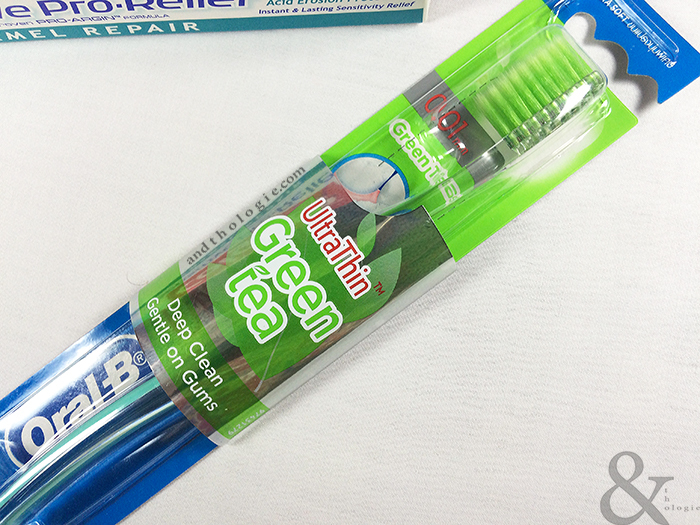 With the Oral-B Green Tea I find that moving it forward a bit towards the middle, and having a thumb or forefinger on an indentation with ribbed stripes in the middle, helps me hold on to the toothbrush more firmly. I think that is exactly what the indentation is for, which is to give you grip but I guess I’m the type who doesn’t usually have my grip where they want me to be. There is the crater; the indentation. 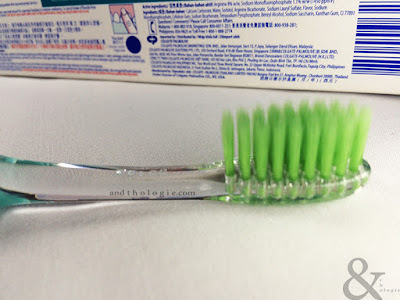 Back to the bristles. At first I thought, because the bristles are too soft, it might not clean as effectively as my regular toothbrush. But, and I can only say this from the point of view of a regular consumer, my teeth feel clean. However, I have added to my routine a whitening toothpaste to hopefully compensate for anything that the fine bristles might miss or too soft to rid. Just be careful though with the toothbrush, since it is soft, you might overdo it and end up being too rough or brushing too vigorously that you end up hurting yourself instead. Just for the record, I brush my teeth 2-3 times a day. But mostly two because, as soft as it is, my gum, in general not just the sensitive area, just cannot take too much brushing. Of course when I decided to change my toothbrush, I never thought that was enough. Around the same time I changed my toothpaste also. 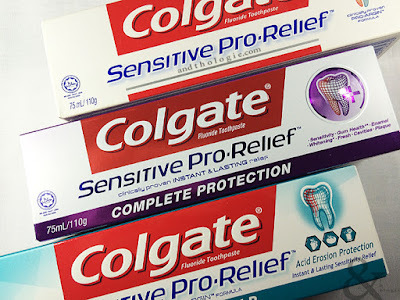 Since I had been using Colgate toothpastes mostly before, I started off with the Colgate Sensitive Toothpaste. After around a week of use I realised that it wasn’t going to be effective enough; the sensitivity did not subside. I changed to the Colgate Sensitive Pro-Relief and found that it worked and have since tried their other Pro-Relief series - the Complete Protection and Enamel Repair - all of them seem to work for me. To repair and protect; that is the motto. I would have kept using the Pro-Relief series except that, once, the store ran out of them and I had to make a decision between the regular toothpastes or Sensodyne; and I chose Sensodyne, and the one I’m currently using is Sensodyne Repair & Protect which seems to work well, as well as the Colgate Pro-Relief series. I think I chose this one in particular because I liked the idea of repairing and protecting, which I hope my teeth and gum are getting. As mentioned above, they seem to have similar effects. The only visible difference is the texture of the toothpastes. 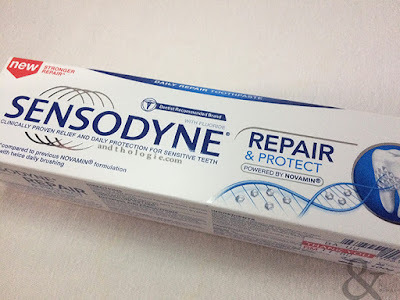 There is a slightly more ’paste’ ness and grittiness, without being abrasive, in the Sensodyne toothpaste, which I never noticed in the Pro-Relief series, or other toothpastes for that matter. I still brush around the sensitive area delicately and try not to push too hard or brush too much. But I have gone a long way from where I started. It used to be that I wasn’t even able to brush the area thoroughly without hurting my gum and causing bleeding. Now, the bleeding is completely gone. The sensitivity is not too pronounced and my life has completely changed because of it. Well, OK that might be exaggerating it a bit. But, you never know how little things bug you and you are worse because of it than if it had gone. Anyway, I'm happy as it is but I think I'm going to have to keep using these toothpastes and toothbrush to keep the sensitivity at bay because if I stop, within a day, the sensitive area becomes a bit tender.